The Great Fire wiped away much of Stowes London and great though this devastation was, what came after was a period of building and expansion that wouldn’t have been possible before. It was time to update Stowe. 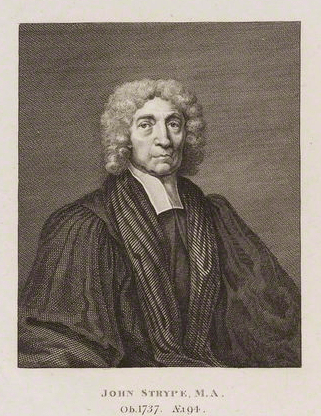 John Strype (1643-1737) was an ecclesiastical historian and biographer. His family were Huguenots and his father a merchant and silk throwster, working just off Petticoat Lane. John was a clergyman, a capable researcher and correspondent, who produced historical and biographical chiefly about the Protestant Reformation. 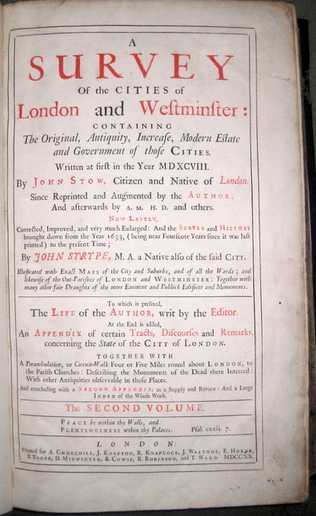 His gift to us social and family historians today, is his publication of a new, hugely expanded version of Stow’s Survey of London in 1720. How lucky are we then that the Stuart London Project, a collaboration between the University of Sheffield and the Leverhulme Trust, has digitized the entire book along with the amazing maps and images contained within the survey. There is so much to excite the family historian about this project. We all like to add flavour to the family history stories we tell and the Stuart period can be tricky. Many of us are able to trace ancestors back to the latter part of this period though. Someone who appears in the 1841 or even 1851 census may have been born in the 1770’s or 1780’s, just fifty years or so on from John Strype’s survey. The street pattern of so much of London has altered that these clear maps are a gift. The parish of St Clement Danes for example shows in amazing detail the buildings around the Inns of Court. The small yards and lanes, many long lost can be picked out. The image of Somerset House gives a wonderful view not just of the house but of the built area around it, not to mention the various crafts upon the River Thames. What else is there for the family historian in John Strype’s Survey of London? Besides being able to search the entire volumes by key words, there is a list of London parishes, which can then in turn be interrogated. A list of benefactors names is also included, so if you happen to be a descendent of Mr George Dottin, Druggist, well here he is, putting his hand in his pocket so that this mighty 18th century survey can be written. The digitization of such works allows you to link your family history data with historic data, add it to your narrative to add flavour and contextual details. This is a great example of open access to books and documents which otherwise, for most of us would remain closed.